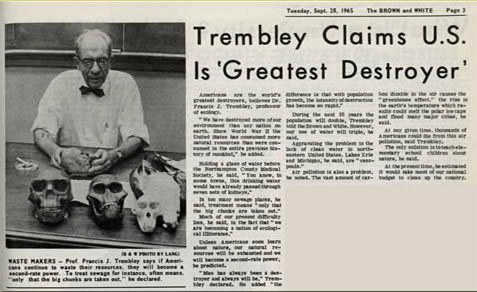 Trembley was increasingly concerned with the destruction of the environment in the U.S. In a September 28th, 1965, Brown and White article, he stated, "We have destroyed more of our environment than any nation on earth. Since World War II the United States has consumed more natural resources than were consumed in the entire previous history of mankind." His concern was mirrored in the weekly articles he wrote for Allentown Call-Chronicle (now The Morning Call) on environmental topics in the late 1960s and early 1970s. He also conducted studies on thermal pollution, the effects of pesticides on the environment, and the effects of cement plant dust on acid water lakes. He protested the use of DDT in Pennsylvania in 1962, and was against the Tocks Island Dam Project.